Birthday Wishes: Want to wish a member of your parish family happy birthday? Click on this link to see who is having one. Call Kelly at 607-637-2571 or e-mail stpauls@hancock.net to have your birth date listed. The Statue Of Rachel in the upper garden and The way of The Cross. St. Paul’s Cemetery at the west end of Hancock. St. Francis deSales Cemetery in French Woods. There are lower and upper parking lots, as well as lawn care and landscaping. For more information, please contact Jerrie VanMater 637-3533. 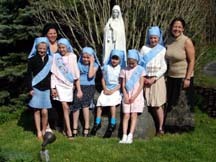 The Catholic Daughters meet on the second Thursday of each month at 7:30 p.m. They are devoted to the Blessed Virgin Mary. Their motto is “UNITY & CHARITY”. For more information, please call Liz Possemato at 637-4475. The Hancock Community Preschool is operated in partnership with The Hancock Community Education Foundation. Sessions are Monday thru Thursday from 8:30 AM to 11:15 AM. Tuition is affordable and available on a sliding fee. Pre-School is open to any child 3 to 5 years of age and if he/she is toilet trained. Do not let your preschooler miss out on this wonderful learning experience. St. Paul’s is a participant in the Hancock Ecumenical “Loaves & Fishes Food Bank” which helps families in the community in need, throughout the year. The food bank was formed more than 30 years ago with a mission to serve the poor. It operates strictly from donations of food and monetary donations. For more information, call Robin Evanitsky at 570-635-5838. Bingo is sponsored and run by the members of The Holy Name Society of St. Paul’s. The first official bingo game was held in The Father Rausch Hall in May 1959. Leonard Sienko worked that game and can you believe that he is still doing it 46 years later, now that’s what you must call real dedication. I’m sure he would like to see some new faces helping out after all these years. 46 years later, the Wednesday Night Bingo is still providing a place of entertainment for many dedicated bingo players from the surrounding communities. The money that is raised by bingo goes to help a variety of worthwhile causes. St. Paul’s has seen many improvements throughout the years that were sponsored by the proceeds from Wednesday Night Bingo. For more information Contact Paul Bartholomew at 637-5409. The toy drive is run by a group of volunteers who want to help make the Christmas Season a little brighter for the children of the community. The fund raiser is a major undertaking. The kick off date is Thanksgiving Weekend and ends on Christmas Day. Donations of toys and money come from the members of the community. The goal is to spread the holiday cheer to every child in the community. Requests come from all sources and are usually filled by the Tuesday prior to Christmas Day. And any request that comes in late are also filled, even if it is Christmas Morning. Volunteers for this important program are always welcome. Contact Maureen Hunt for more information at 637-2757.